Today, June 25th, is the anniversary of the Presentation of the Augsburg Confession. 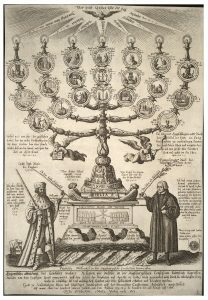 While Luther’s posting of the 95 Theses on October 31, 1517 was the spark that ignited the Reformation, it wasn’t until the presentation of the Augsburg Confession on June 25, 1530 that we see what we might term a distinct Evangelical Lutheran Church. For it is in this confession made at Augsburg where those Reformation principles of grace alone, faith alone, and Scripture alone are clearly articulated and set forth. It consists of twenty-one articles held by the evangelical Lutherans – those in common with the Roman Catholics, those in common with the church fathers, those in opposition to the unscriptural teachings of Rome, and those in distinction from the Zwinglians, Anabaptists, and other radical Reformers; and seven articles relating to abuses in the Roman Church which were deemed most objectionable and had already been changed and corrected in the Lutheran churches. On this day, we thus thank and praise our heavenly Father for the example of the unswerving and fearless confessors of Augsburg who, by the way, were all laymen. And we ask that the Holy Spirit would preserve us, our pastors and members of our congregations, in that same confession of faith unto everlasting life and to inspire us to pass on this saving faith to future generations. Lord God, eternal King, You have built Your Church on the foundation of the apostles and prophets with Jesus Christ as the chief cornerstone. As You preserved the proclamation of Your Word through the confession made at Augsburg many years ago, keep us firm in the true faith also in our day. Send forth Your Holy Spirit that we may confess Your Son before others, knowing that He confesses us before Your throne of grace; through the same Jesus Christ, our Lord, who lives and reigns with You and the Holy Spirit, one God, now and forever.